Avery Barks dedicates all of her spare time to training search and rescue dogs and helping the animals. That dedication soon lands her unemployed and out of options. 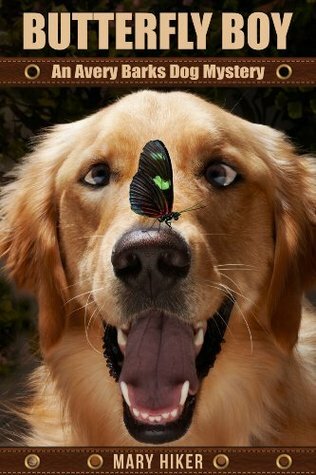 While helping an elderly friend, Avery and her butterfly loving dog, Chevy, find the unthinkable – a dead body. The sleepy North Carolina mountain town she calls home is shocked and shaken to the core. With her trusty canine companion by her side, Avery must follow the clues and solve the murder mystery before she winds up on the suspect list. Butterfly Boy is a standalone book in Mary Hiker’s popular Avery Barks cozy mystery series. With fun characters, lots of twists and turns, and a lovable dog, it’s easy to see why people enjoy these books. This is a short book (about 70 pages) but it is a complete story. I enjoyed getting to meet the characters and spend time with them. Avery is a hard working woman and she really enjoys spending time training dogs for search and rescue. And she is very good at her job. I also enjoyed meeting and spending time with Chevy, Avery’s dog. For me, the author did such a good job of describing Chevy, his actions and his behavior. I felt like I was with him, watching him romp and just being an adorable dog. He just became so alive in my mind and that was such a plus in my book. The other thing I really enjoyed about this book was the search and rescue aspect. Search and rescue is one of my favorite types of books to read and I thought this book is a great addition. The writing style flows smoothly and the book is an easy read. There was a mystery to solve, and although it was not the most complicated mystery to solve, it was enough that it held my attention. I would recommend this book to anyone who enjoys a well crafted mystery that revolves around an adorable dog. Just look at the cover to see how cute he is. I am looking forward to reading more adventures of Chevy, AKA Butterfly Boy.